NEW YORK CITY — There’s no place like New York’s Madison Square Garden for watching a full-blown phenomenon come to life before your eyes. Florida Georgia Line‘s sold-out show Wednesday night (Feb. 25) on their Anything Goes tour was not only a dream come true for the duo, as they reminded the audience numerous times, it gave true nationwide validation to the duo’s superstar status. Sure, they’ve got a slew of huge country hits. But to paraphrase a classic NYC anthem, if they can make it there, they’ll make it anywhere. Especially given the pair’s predilection for tossing generous doses of hip-hop into their pop-country mix. 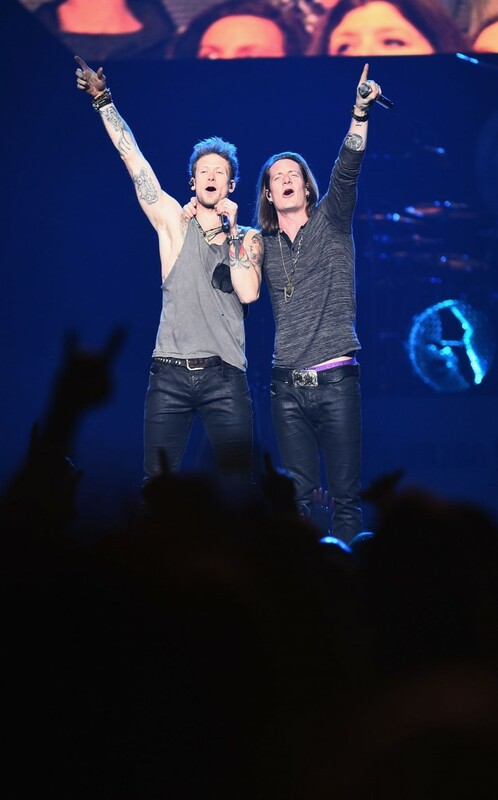 After all, it’s one thing for Tyler Hubbard and Brian Kelley to strut their rhymes and dance moves for a Nashville crowd, but a couple of country boys letting their flow go in the city where hip-hop was born is another story. After opening sets by Frankie Ballard and Thomas Rhett (the latter offering a touch of foreshadowing by closing his set with the Bruno Mars funk-pop smash “Uptown Funk”), Florida Georgia Line took the stage with a bang, literally. Hubbard and Kelley shot straight up into the air from apparatuses at either end of the vaguely sci fi-looking set as if they were hydraulically propelled. Instead of hitting the crowd over the head with the hits right from the start, they kicked off with a pair of nonsingles from their 2014 No. 1 album, Anything Goes— “Every Night” and “Smile.” By the second song, Kelley had stripped down to a muscle shirt, giving a spotlight to both his gym-rat physique and his tattoos. This move garnered no audible dissent from the strikingly high percentage of giddy young girls in the audience. After Hubbard, Kelley and their larger-than-life backing band pulled out their 2013 platinum single “Round Here,” Hubbard returned to marveling at their current circumstances, declaring the evening “a check off the old bucket list for your boys.” Two more Anything Goes tunes — “Good Good” and the title track — followed. “We spent a lot of nights on a very, very small stage in front of about 20 people, dreaming of being in Madison Square Garden one day,” Hubbard said. As if to express their wonderstruck feeling about that dream becoming a reality, the duo dove into “Dayum, Baby,” the song they cut with Sarah Buxton on their debut album. Things were pared down to an acoustic-based setup for “Dirt,” the 2014 No. 1 ballad that surprised anyone who might have written the band off as a one-trick pony. Calling out, “From MSG to heaven,” he led the crowd in a singalong to close the song. Then came the segment of the show that seemed to speak volumes about what makes Florida Georgia Line tick — a wildly eclectic covers medley that Hubbard said reminded him of “back in the days when me and BK made mixtapes off of Napster,” though most of the tunes turned out to be contemporary. Meghan Trainor’s “All About That Bass” gave way to Dr. Dre and Eminem’s “Forgot About Dre,” Wiz Khalifa’s “We Dem Boyz,” Bruno Mars’ “Treasure” and, finally, Garth Brooks’ “Friends in Low Places.” You couldn’t ask for a better illustration of the influences behind FGL’s country/pop/hip-hop amalgam. Unsurprisingly, the duo ended the night with “Cruise,” the 2012 megahit that put them on the map and started them on a journey that seemed to reach some sort of pinnacle — at least for Hubbard and Kelley — on this 2015 winter’s night in New York City.